Endoscopic ultrasound-guided hepaticogastrostomy (EUS-HGS) has been indicated for failed endoscopic retrograde cholangiopancreatography (ERCP)  . Recently, to obtain a longer duration of stent patency or avoid adverse events, EUS-HGS combined with antegrade stenting (EUS-HGAS) has been reported  .In this procedure, an uncovered, self-expandable, metal stent (UCSEMS) is usually used to avoid stent dislocation. However, compared with a fully covered, self-expandable, metal stent (FCSEMS), longer stent patency may not be achieved . 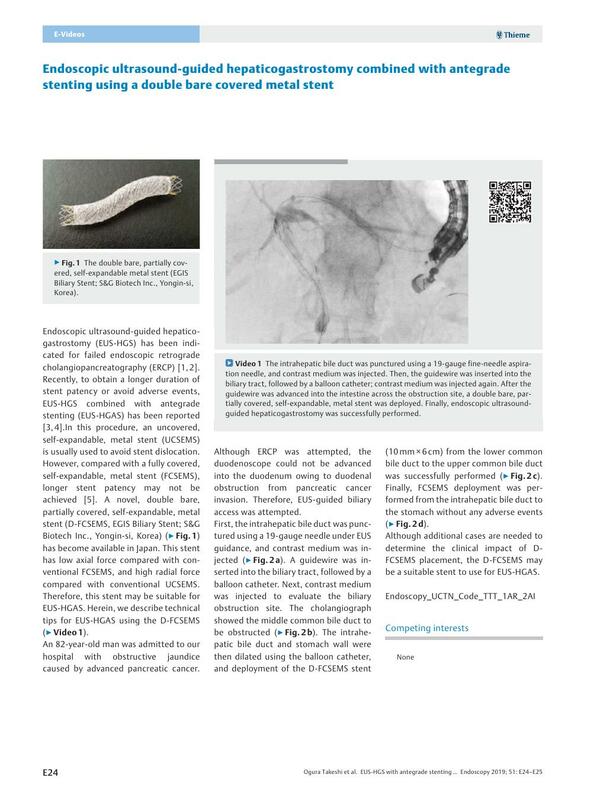 A novel, double bare, partially covered, self-expandable, metal stent (D-FCSEMS, EGIS Biliary Stent; S&G Biotech Inc., Yongin-si, Korea) ([Fig. 1]) has become available in Japan. This stent has low axial force compared with conventional FCSEMS, and high radial force compared with conventional UCSEMS. Therefore, this stent may be suitable for EUS-HGAS. Herein, we describe technical tips for EUS-HGAS using the D-FCSEMS ([Video 1]). Fig. 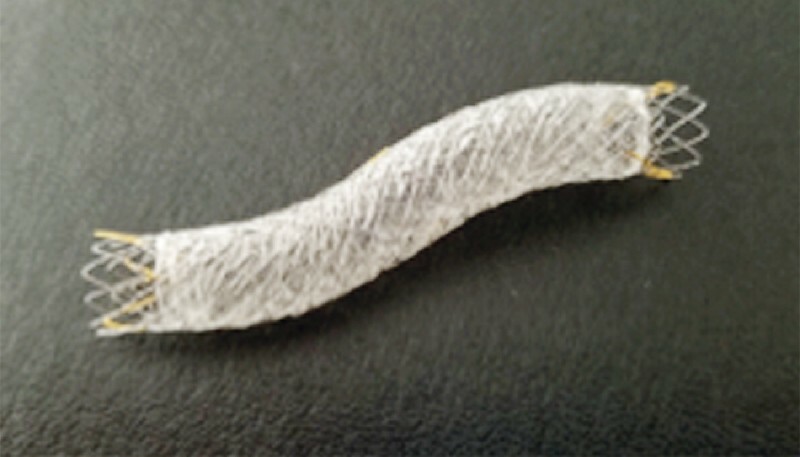 1 The double bare, partially covered, self-expandable metal stent (EGIS Biliary Stent; S&G Biotech Inc., Yongin-si, Korea). Video 1 The intrahepatic bile duct was punctured using a 19-gauge fine-needle aspiration needle, and contrast medium was injected. Then, the guidewire was inserted into the biliary tract, followed by a balloon catheter; contrast medium was injected again. 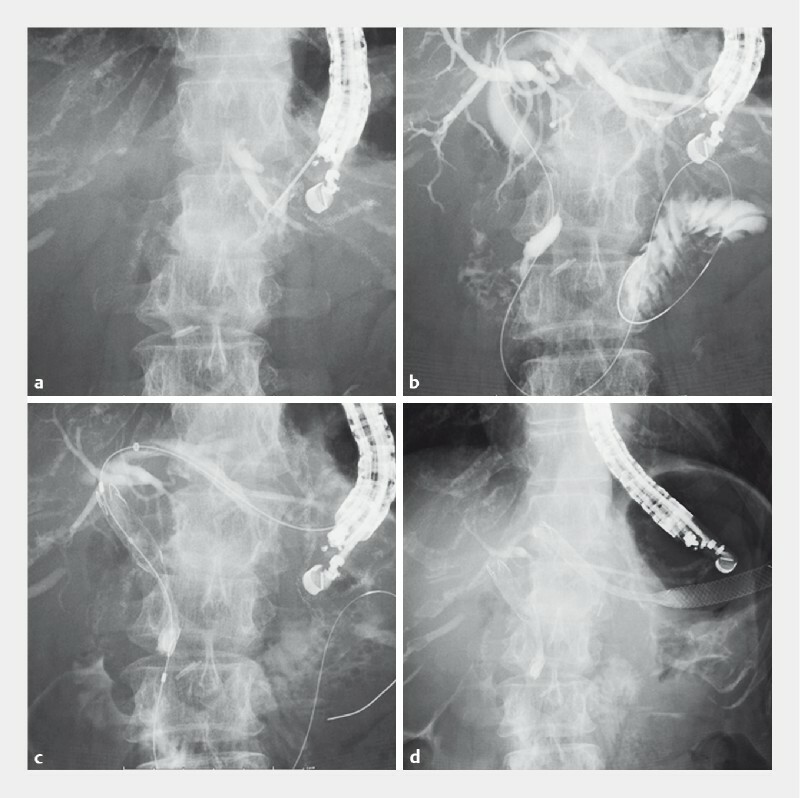 After the guidewire was advanced into the intestine across the obstruction site, a double bare, partially covered, self-expandable, metal stent was deployed. Finally, endoscopic ultrasound-guided hepaticogastrostomy was successfully performed. An 82-year-old man was admitted to our hospital with obstructive jaundice caused by advanced pancreatic cancer. Although ERCP was attempted, the duodenoscope could not be advanced into the duodenum owing to duodenal obstruction from pancreatic cancer invasion. Therefore, EUS-guided biliary access was attempted. First, the intrahepatic bile duct was punctured using a 19-gauge needle under EUS guidance, and contrast medium was injected ([Fig. 2 a]). A guidewire was inserted into the biliary tract, followed by a balloon catheter. Next, contrast medium was injected to evaluate the biliary obstruction site. 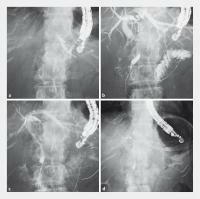 The cholangiograph showed the middle common bile duct to be obstructed ([Fig. 2 b]). The intrahepatic bile duct and stomach wall were then dilated using the balloon catheter, and deployment of the D-FCSEMS stent (10 mm × 6 cm) from the lower common bile duct to the upper common bile duct was successfully performed ([Fig. 2 c]). Finally, FCSEMS deployment was performed from the intrahepatic bile duct to the stomach without any adverse events ([Fig. 2 d]). Fig. 2 Cholangiography. a The intrahepatic bile duct was punctured using a 19-gauge needle, and contrast medium was injected. b Obstruction of the middle common bile duct was seen. c Antegrade stent deployment from the lower to the upper common bile duct was performed using the double bare, partially covered, self-expandable, metal stent. d Endoscopic ultrasound-guided hepaticogastrostomy was successfully performed. Although additional cases are needed to determine the clinical impact of D-FCSEMS placement, the D-FCSEMS may be a suitable stent to use for EUS-HGAS.